I have one of those green REI microfiber pack towels. I'd like to bring it on a long-distance tour next summer, but it is huge, and I only really need about a quarter of what I've got. I'm considering cutting off what I need rather than buying a new, smaller one. My question is whether anyone has done this and how the towel holds up once it's cut. Specifically, does it fray, and if so, how badly? I use two bar sized towels that I bought at Dollar Tree and sewed together into one. Cost, $2 plus tax. 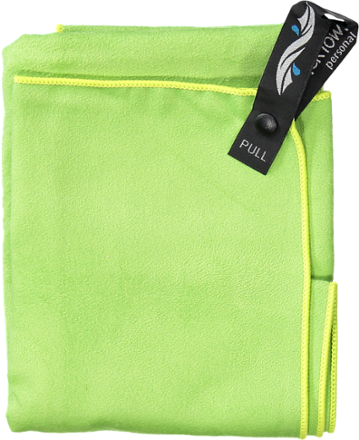 The towel material does not absorb much moisture which you would think makes it a terrible towel, but on the other hand it dries faster than just about anything else I own. It is the orange thing hanging on my clothesline. If it is too big, only buy one. Do you cut off toothbrush handles too? after 20 years i can say, It does not fray .. I've been using these around the house and decided to take about (10) with me on tour. It's very handy and washes out easy and dries fast. They are good for everything from wiping your forehead to wiping your behind. They pack small. You can find them really cheap and in multiple sizes at car parts stores. $20 at REI, $4 at Autozone. Same towels. Get in the zone. Exactly. I got a huge pack of them at Home Depot on Sale for $6. They are almost disposable at that price, and I wouldn't hesitate to cut one down to a perfect size. No, actually I'm not concerned about weight, but volume. 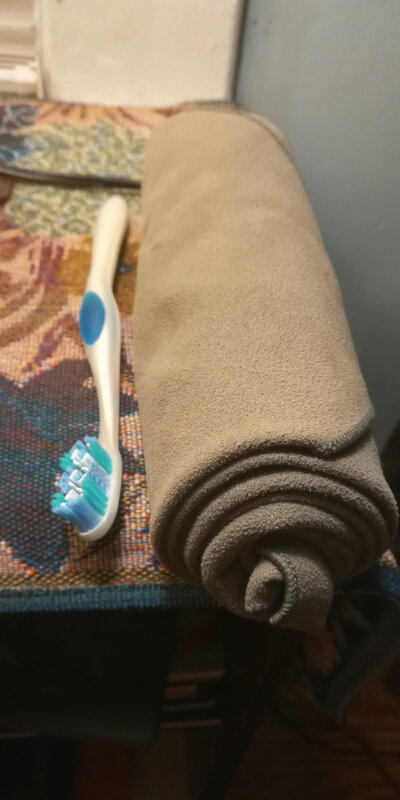 When tightly rolled, this towel still seems rather bulky given the needs of my planned tour (OK to Seattle in the early summer). Drip dry after a shower (or self-squeegee with synthetic jersey) should be fine. I'm going to face some long distances between towns. I'd feel better cutting the towel to make room for something I can eat or drink, which means I'll gain, not lose, weight. And it's good to hear this fabric won't fray! It is the orange thing hanging on my clothesline. Yep, that looks about the size of my REI towel. 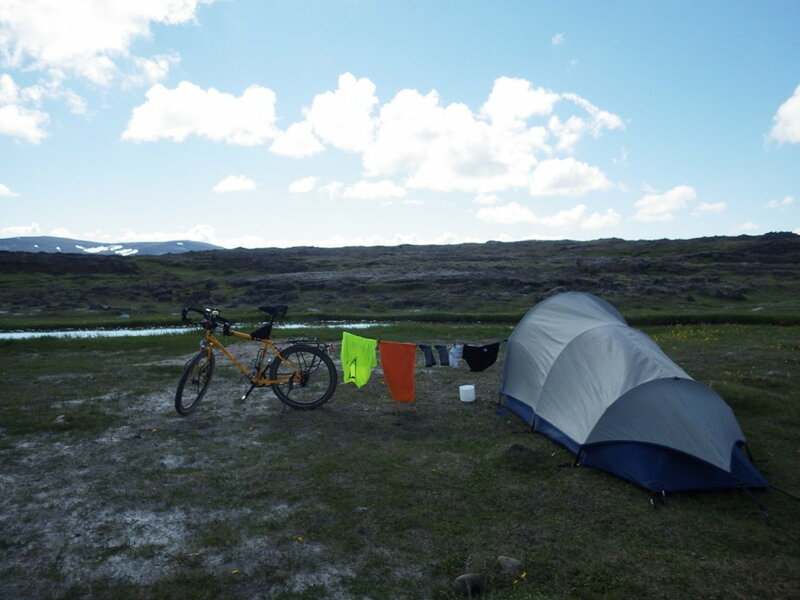 Yes, something sized to smaller jobs like drying off after a creek-side sponge bath or to wipin down the inside of my single-wall tent in the morning, though the latter may require a bit more absorbancy than the former on some mornings. Thought I'd weigh in and answer your actual question. I bought one of the larger pack towels (can't remember what size, although it wasn't the bath towel size) to split with my son. I cut it in half and asked a kind member of our church's quilting group to stitch up the cut side. She did, said it was very simple. Works perfectly. IDK what you got , None of my 'Pack Towl' products have had sewn bound edges . as others suggest, go get some cheaper alternatives..
Again, the OP's question was not, "Should I cut this thing in half or get a new towel?" It was, "Can I safely cut this thing in half?" This is one of the few things about BF that makes me crazy. Again, the OP's question was .....one of the few things about BF that makes me crazy. understand completely. seems crazy to ask these questions when the answers are freely available on the googles. There are only a few? You are tougher man than I. BTW...I heard that if you cut a plastic towel in half it can asplode like a crabon fibre frame. REI also has a mini-towel that rolls up to a small case abut the size of a golf ball. So far I've had good luck with mine, and it dries off quickly if tied to the outside of one's load. You could always hem your towel. but I got them 3 decades ago.. So You are crazy, it's your reaction-choice... , nothing I can Do about that.. I don't make you Obsessive, maybe the internet forums fosters that tendency..